Pastor Carter Conlon is senior pastor of Times Square Church in New York City, an interdenominational church with more than 10,000 people in attendance, representing more than 100 different nationalities. 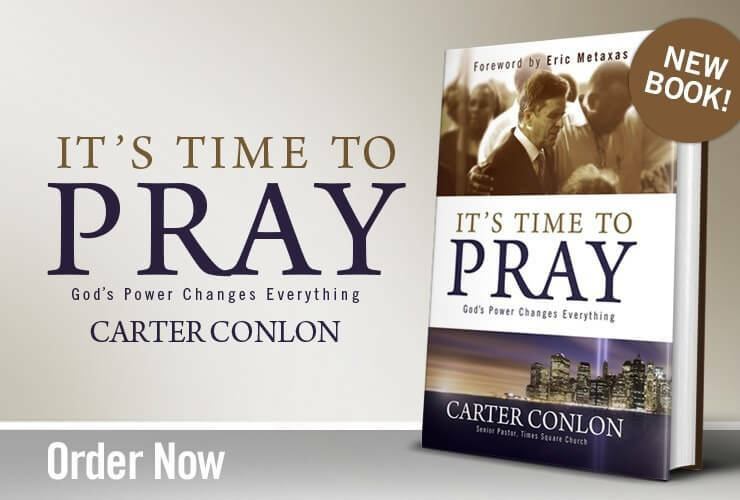 Pastor Carter’s new book It’s Time to Pray: God’s Power Changes Everything. The book is a powerful teaching on the power of prayer compellingly illustrated by his own life experiences, most of which he is sharing for the first time in the book. “Just as Esther was prodded by Mordecai to approach the throne of the king for the sake of her people, I’m hoping that this book is going to prod many people to go back to the throne of God to find, as the Scriptures say, grace and strength to help in this present time of need. I believe that the lives of many people are now hanging in the balance, spiritually speaking, and if we will start to pray again, as the people of God, we can know a spiritual awakening again in America. It really is a very short window the Lord has set before us.